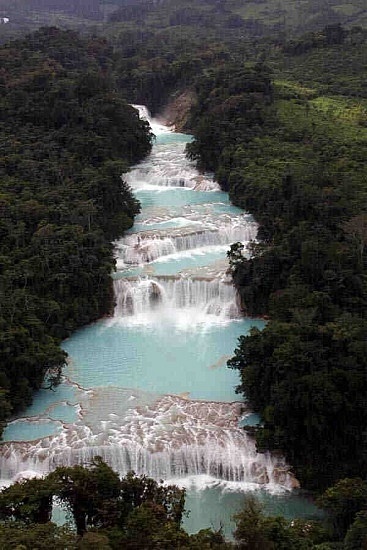 The Cataratas de Agua Azul (Spanish for "Blue-water Falls") are found in the Mexican state of Chiapas. They are located in the Municipality of Tumbalá, 69 kilometers from Palenque by the road that leads towards San Cristóbal de las Casas. This waterfall consists of many cataracts following one after another as can be seen in the first photo in the picture gallery, taken from near the top of the sequence of cascades. The larger cataracts may be as high as 6 meters (20 feet) or so. The one pictured to the right is next to the bottom of the sequence.